There are three major improvements to this Sharpening System: Delrin plates for easy removal of used finishing film, an upgraded tightening knob, and larger feet for added stability. I’ve tested this new system for over a year for all the knives I make. Verdict? Excellent, IMHO. Sharpening System 3. End view with Delrin plates. First, and most importantly, the support plates for the microfinishing film are now made of Delrin instead of aluminum. This makes it possible to easily peel off the worn finishing film without using solvents or a fair amount of elbow grease. It stays flat, and doesn’t dish out. The microfinishing film stays in place when in use. The Delrin plates are first machined, then hand lapped. 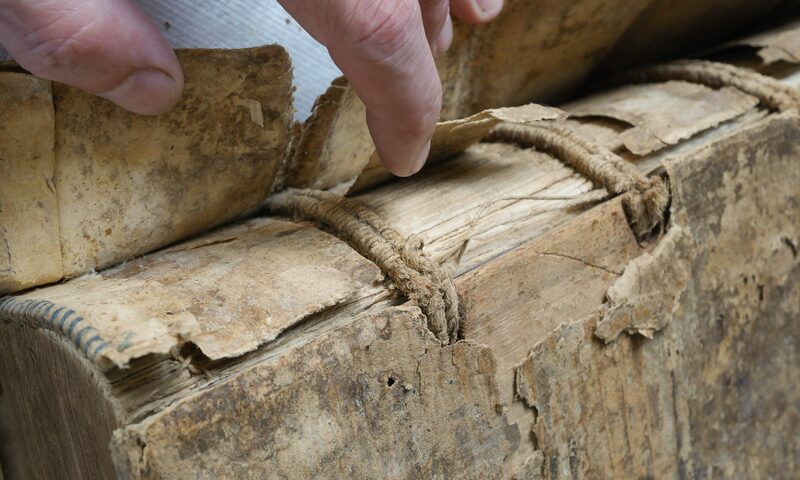 They are 12″ long, 2″ wide, and 3/4″ thick. Sharpening System 3. Detail of the precision knob. The second upgrade is to the adjustment knob. Previously, it was simply tapped through the end of the stand, with a coarse thread. The new adjustment knob is made from stainless steel, has a very fine pitch, threaded through a phosphor bronze bushing. There is virtually no backlash, and nothing to rust. The end of the threaded rod contains a rounded ball, which prevents torquing of the plate while tightening. I’ll be the first to confess that this optical grade adjuster is not absolutely necessary, but, man, it is nice! Like a manual focus Leica lens. Precise and accurate tools help perform precise and accurate work. At least, his is how I rationalize expensive tools… . Lastly, in order to make the stand a bit more stable, the hard rubber feet are now one inch wide, with a flatter profile, giving more anti-slip contact with your bench. They can also adjust a bit to level. This Sharpening System is a quick and convenient way to sharpen, resharpen and keep all your knives and edge tools in peak condition, from scalpels to scimitars, plane blades to plough blades. This is a lightweight, easy to store and unbreakable system. Perfect for travel and classroom use, since there are no expensive stones to dish out, glaze over, or break. The 3M finishing film cuts all modern high tech steels quickly and evenly. Replacement 80 micron film is available from Rio Grande; the 40, 15 and 5 micron from Tools for Working Wood. 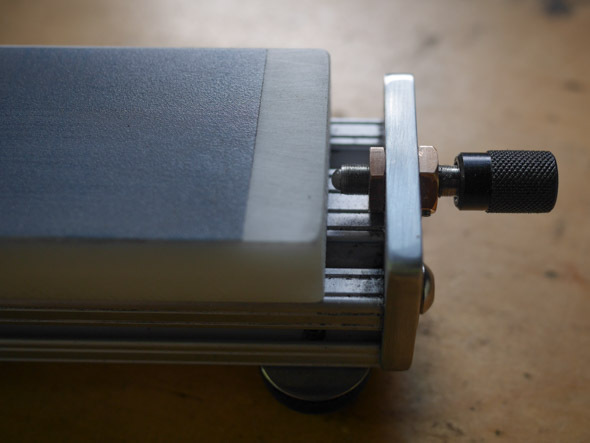 The system contains everything you need: a sharpening stand, two Delrin plates, four 11 x 2″ strips each of 80, 40, 15 and 5 micron 3M PSA micro finishing film, a 12 x 2″ Genuine Horsebutt Strop, and 1 oz. bar of green chromium oxide honing compound. If you’re making tools of this quality, then I think it’s time you got your own die stamp to mark them, so that the advertising is comparable to the tool efficiency. Good point. My handwriting makes the tool look cheaper/ sloppy? Do you know a company who makes these? Can they be struck by hand? I do have a stamp like this, though it is made for wood and leather. I looked up die stamping aluminum a bit, turns out it is one of the more difficult materials to stamp, and most people outsource it, with 500 piece minimums. A little more than I will sell anytime soon! 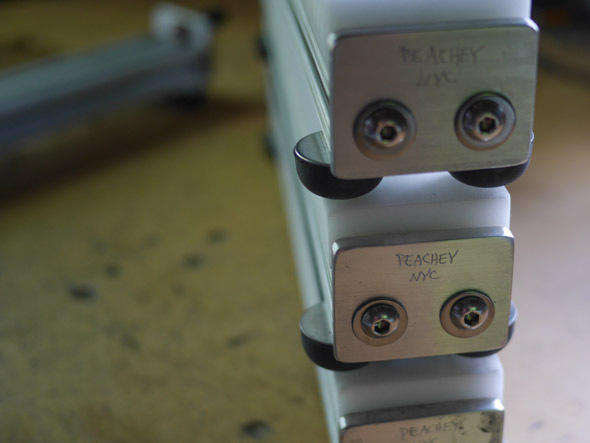 Likely a label, like the aluminum label I use on my board slotting machine https://jeffpeachey.com/2012/12/11/manual-peacheyboard-slotting-machine/ is the way to go for this. Would a label like this make you more likely to purchase the system? Have you tried using your stamp on aluminum? The jewelers forums are full of folks hand stamping aluminum blanks, although your thicker plate might prove more difficult to stamp. In any event I still sharpen on oil or water stones and doubt I’d change old habits, so my purchasing the system is unlikely, even with a die stamped mark. I just thought such a nice product might want more than a hand written mark.